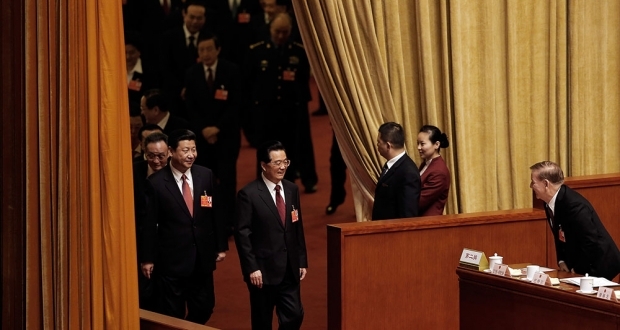 Then President Hu Jintao and incoming President Xi Jinping enter the Great Hall of the People at the fourth plenary meeting of the National People’s Congress in March 2013. In this series, co-sponsored by ChinaFile and Financial Times Chinese, American and Chinese observers of the U.S.-China relationship analyze tensions between the two countries, how views differ on their causes, and how they ought to be addressed. Each pair of essays, one from an American writer and one from a Chinese writer, will run in English on ChinaFile and in Chinese on the FT. ChinaFile will follow their publication with a selection of comments from Chinese readers translated into English. A version of this article in Chinese appears on FT Chinese. In her recent article, “What China’s Lack of Transparency Means for U.S. Policy,” U.S.-China relations expert Susan Shirk caused a stir when she argued that China’s “lack of transparency” around public policy making, defense, national security, and Chinese attitudes toward the United States are hurting Sino-U.S. relations. Many of Shirk’s observations about this “lack of transparency” reflect the well-known realities of Chinese politics. However, Shirk overlooks the real reasons behind these patterns, and to a great extent she confuses cause and effect. In contrast to the political process in more developed Western countries, Chinese policymaking rarely involves public hearings or lively parliamentary debate. But that does not mean it is a total “black box.” In fact, most policies are hammered out by means of an intensive process of debate and argumentation. But unlike in Western countries, this debate process takes place within the system and is rarely open to criticism from outside parties. Information is tightly controlled in an effort not to give the public the impression that the Party is divided on any issue. Debate, even outright confrontation, is the norm in Chinese policymaking, and the fact that it is taking place is common knowledge. It is not “open” in the sense of being broadcast to the public, but there is a large elite class that is fairly well informed about what is going on. Because these élites are increasingly connected with the outside world, the speed at which news about policymaking reaches the public, even in foreign countries, can be quite fast. Of course, the unsystematic dispersal of information creates much rumormongering and hearsay. To be blunt, because of economic ties between elites within the Chinese system and foreign corporations and institutions (who often employ their children and relatives), these outside groups often get quicker, more detailed, and more comprehensive news about Chinese policymaking than do many elites within the system. It is not China’s lack of openness that hurts Sino-U.S. relations, but the tenseness of Sino-U.S. relations that keeps China from being open. Except for policies that concern sensitive ideological issues or national security (which I will go into later), the Chinese policymaking process has been relatively open for a long time. The reason that China has not developed the debate-show style of political discourse so familiar to citizens of Western democracies is that, in addition to China’s cultural emphasis on harmony and unanimity, and the view that factional struggles are bad for the country, the C.C.P. believes that public disagreements on policy issues undermine the Party’s authority and cohesiveness, and that technical debates can easily evolve into ideological struggles. In the past, such struggles have been catastrophic for both the Party and the nation as a whole. For China, as a latecomer to modernization, regionalism and sectarianism are the primary foes. These forces not only impede the formation of a unified market and a modern legal system, but create interest groups built on nepotism. In a sense, the development of late-modernizing countries comes down to the taming of regionalism and sectarianism by a rational bureaucracy. However, rational bureaucracies do not appear out of thin air, and in most failed Third World states the supposedly modern bureaucratic apparatus has been coopted by regionalist and sectarian forces. Only a few countries have recognized the importance of a rational bureaucracy, and thereby avoided this tragedy. In South Korea, Korean military groups that served in the Kwantung Army during Japanese occupation evolved into the civilian bureaucratic hierarchy. And in China, the model of social mobilization used by the Party in wartime later formed the basis of a rational bureaucracy. The Chinese Communist Party (C.C.P.) won the civil war because it was a tighter-knit organization, was better than the Kuomintang at mobilizing support, and was more effective at combatting sectarianism and regionalism and at drawing on society’s resources to meet the needs of the war. After the Revolution succeeded, the P.R.C.’s system of governance developed according to the organizational model established by the Party during the revolutionary years. The C.C.P.’s power depended directly on the state apparatus’ ability to mobilize society. When the Party’s power declined, the state’s governing capacity declined as well. After Reform and Opening, the Party’s diminished clout led to a resurgence of regionalist and sectarian forces within the government. It is these forces that now present the greatest challenge to deeper reforms. Only from this perspective is it possible to understand why Xi Jinping must first enforce strict Party discipline in order to promote further reform, for only the Party has the power to propel China into modernity. As a result, making the policymaking process more public can easily evolve into publicizing internal Party disputes. And history tells us that as soon as this happens, not only will factional infighting sap the Party’s vigor, but as “hundreds of flowers bloom,” the Party’s conservative wing, which commands the ideological heights, will very likely suppress the pragmatic reformists and reforms will consequently lose ground. It is at times like these, as we enter the “deep-water phase” of reform, that it is most crucial to exercise proper restraint in opening the policymaking process to the public. While Shirk makes some valid points about public policy making in China, her conclusion that China’s defense and national security policies make other countries apprehensive is a typical confusion of cause and effect. Ever since 1949, China has been subjected to many external pressures. With the Soviet Union to the north, India to the south, and the U.S.-backed Japan, Taiwan, and ASEAN countries to the east, the P.R.C. has always been surrounded by powerful rivals. After a century of invasion and encroachment beginning in the late Qing dynasty, it is understandable why, when subjected to such pressures, China leans toward secrecy, not openness. This does not mean that China is plotting against its neighbors; rather, secrecy arises from China’s insecurities about its own safety. Needless to say, any country threatened by a superpower is likely to be reluctant to share its military secrets. And in fact, as China grows stronger it is becoming more open on national security issues. But right now, the greatest obstacle to China’s embracing “transparency” is its fear of America. The U.S.’s hardening stance toward China, along with its support of Japanese remilitarization and its backing of other claimants to the Spratly Islands, has made China feel more and more pressured in recent years. Considering the power imbalance between China and the U.S., particularly in the military arena, it is easy to understand why China prefers a policy of secrecy. Outgunned as it is, hemmed in on all sides by the U.S., Japan, Taiwan, the ASEAN countries, and Australia, and facing an increasingly unilateral, even imperialist, America, it would be irrational for China not to play its cards close to its chest. That the U.S. and other Western countries can maintain such a high degree of transparency on national defense issues is largely a product of historical circumstance. During the Cold War, Europe was effectively occupied by the U.S. military, and under the structure set up by NATO, European countries had no secrets to keep from the United States. China can never achieve this degree of openness. Moreover, is the U.S. satisfied with Europe’s current level of “transparency”? Given what we know about the CIA’s surveillance of three French presidents and German chancellor Angela Merkel, it seems that even the high degree of openness maintained by America’s closest partners does not satisfy the U.S.’s lust for control. And considering what befell Qaddafi and Mubarak when they transitioned from secrecy to openness, we must conclude that withholding no information from the U.S. is an invitation for U.S. interference. It is unfair for America to demand that China, the weaker partner, be open about its military affairs while not giving China adequate reassurances about its own security, for at times like these, secrecy is a part of security. In other words, it is not China’s lack of openness that hurts Sino-U.S. relations, but the tenseness of Sino-U.S. relations that keeps China from being open. Complaining that China’s lack of transparency scares America is as laughable as a heavyweight boxer whining about how his middleweight opponent will not reveal his fighting techniques. And plus, is this heavyweight boxer really so ignorant about the competition? It is common knowledge that the CIA has hordes of Chinese informants and does a tremendous amount of work in China. China has no secrets that the U.S. does not already know. Shirk suffers from a cognitive impairment about China not because of China’s lack of transparency, but because the U.S. is not open about its intelligence work. To complain that China’s lack of transparency hurts U.S.-China relations is a joke, and not a very funny one at that. I’m pleased that my article on the lack of transparency in China’s political system has stimulated this intellectually interesting commentary from Chu Yin. Chu elaborates my argument that China’s leaders keep the policy process secret because they are afraid of revealing differences among themselves to the public. The system is too fragile to allow citizens access to information about how policies are made. As he explains, “information is tightly controlled in an effort not to give the public the impression that the Party is divided on any issue.” He confirms that the reality contradicts this manufactured image of elite unity. There are sharp disagreements within the Party and the government. But, Chu says, “public disagreements on policy issues can undermine the Party’s authority and cohesiveness, and technical debates can easily evolve into ideological struggles.” In other words, because C.C.P. rule is prone to leadership splits and has no institutionalized mechanism for resolving them, secrecy is required for Party rule to survive. Chu goes on to contrast the risks of transparency during two different periods of time: the 1979-2012 period when the Communist Party stepped back and delegated more authority over policymaking to the government; and the Xi Jinping era when the C.C.P. has “made itself the main force responsible for policy making and implementation.” In the earlier period, the “the Party’s diminished clout” led to what he labels “regionalist and sectarian forces” that threatened the system’s fragile unity. Presumably what he means is that different provinces and bureaucratic agencies competed for economic policies that would most benefit them, a normal feature of public administration in most other countries. Today, however, now that the Communist Party under Xi Jinping tries to manage policy by itself, “issues of administration,” which normally belong to the government, and “issues of ideology,” which normally belong to political parties, have become intertwined. As a result, Chu Yin says, policy debates have become imbued with a political significance that goes beyond administration, “even raising them to the level of intensely ideological disputes over the ‘Party line.’” Therefore, he argues, if the policymaking process were to become more public, it could “easily evolve into publicizing internal Party disputes.” Moreover, the Party’s conservatives who “command the ideological heights” (presumably through powerful bodies like the propaganda and security agencies) will “suppress the pragmatic reformists and reforms will consequently lose ground.” In other words, Chu argues that if you support reforms you should support keeping the policymaking process secret from the public. Chu’s commentary supports my view that the lack of transparency about policymaking reflects the fragility of the Chinese political system. Chinese leaders believe that only by presenting a façade of unanimity at the top can they prevent élite conflicts from spilling out and mobilizing public opposition. Chu’s final point about China’s lack of willingness to be transparent on foreign and security policy because it is weaker compared with the U.S. is a more conventional and less interesting argument that I won’t address here. No doubt, he has provided yet another rationale for why China’s political system remains secretive, but my argument was that too much secrecy, even in the area of foreign and security policy, hurts a country’s relations with the outside world. One does not have to look too far to find how North Korea’s secrecy has hurt its relations with the rest of the world.